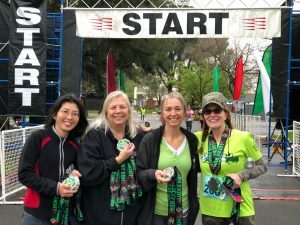 Saturday, March 23rd was the 9th Annual Lucky Run in Davis. 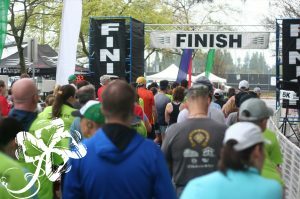 As runners, walkers and volunteers converged upon Davis High School in the morning for the event, the rain let up and provided dry conditions for the event. Intended to celebrate both St. Patrick’s Day as well as the start of Spring (the season officially was underway the Wednesday prior to the event), the race offered 5K (3.1 mile), 7K (4.34 mile) and 10K (6.2 mile) runs, plus a kids fun run. In the 5K, Davis residents Erik Blosser and Sarah Kay finished first and second to claim th e titles of men’s and women’s overall winners. Their elapsed times were 18:35 and 20:34, respectively. J.R. Mintz, of Santa Clara, was the overall champion in the 7K distance, clocking in a finish time of 31:37. Ten year old Aspen Townsend was the first female finisher, with a time of 35:47. 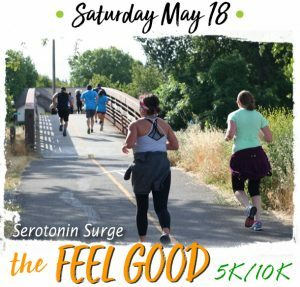 Jason Hoang captured the 10K title with a time of 36:51, and when Marjorie Longo crossed the finish line at 44:12, she added Female Overall Winner at the Lucky Run 10K to her running resume. Complete race results can be found online here. Official race photos will be available here. The event was supported by many community volunteers, including individuals from youth service groups such as the Woodland High National Honor Society, Davis High National Honor Society, Davis High Key Club, Davis High School CSF, and volunteers from Will C. Wood High School in nearby Vacaville.